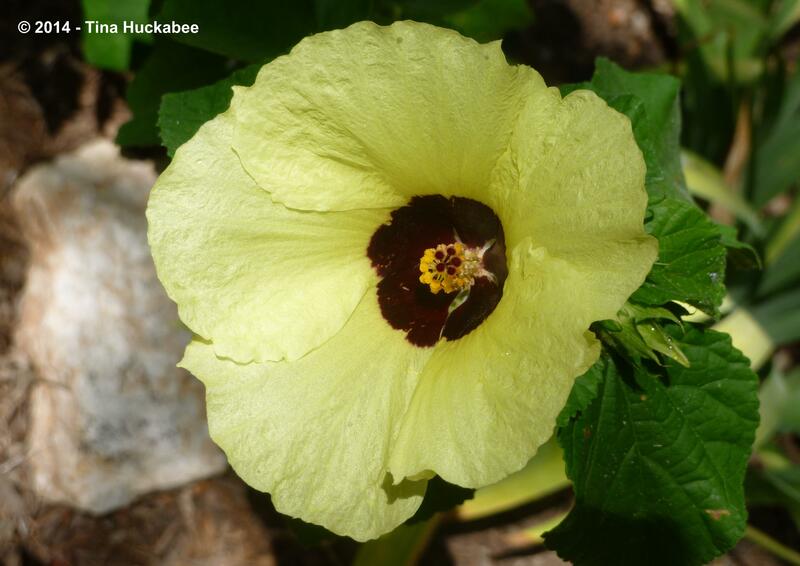 A while ago, I wrote about a favorite plant in my gardens, the Lemon Rosemallow, Hibiscus calyphyllus. 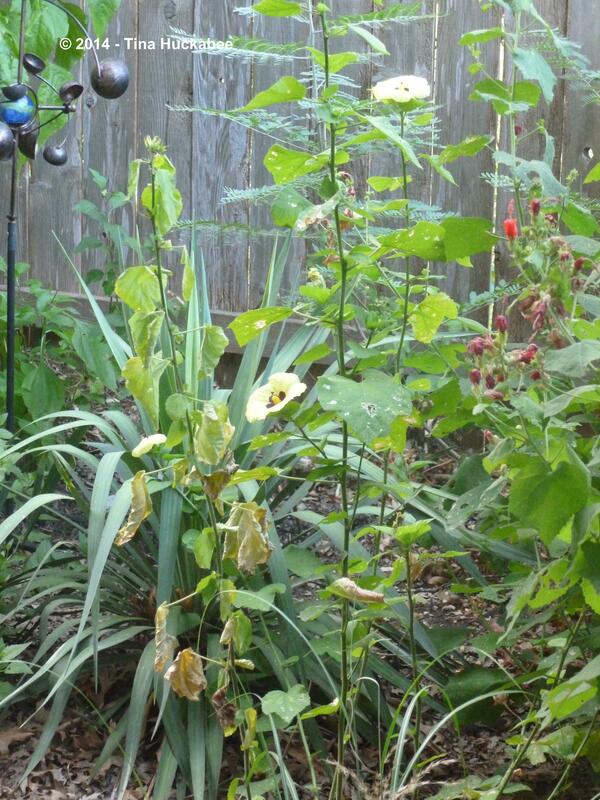 The Rosemallow is still one of my favorite summer bloomers, but sadly, my original plant appears to be dying. 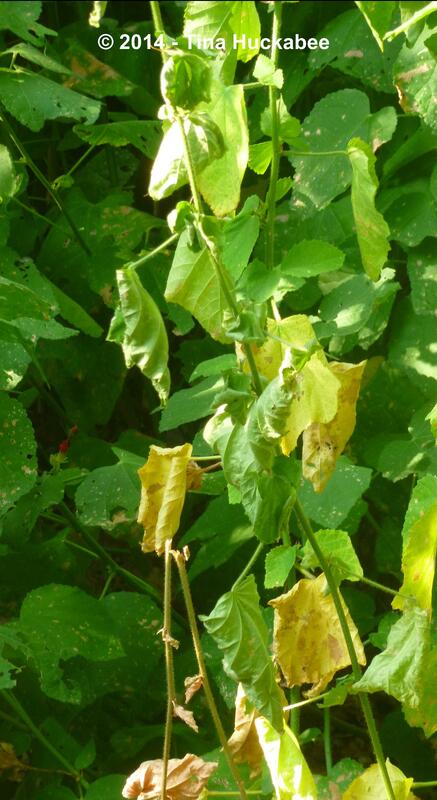 One-by-one, in this past month or so, the leaves have turned yellow and wilted. …the entire branch, with leaves, has turned crispy and died. Even as the stems die off, the remaining dwindling-in-number healthy stems have continued to produce blooms. Such a stalwart, stoic little hibiscus. 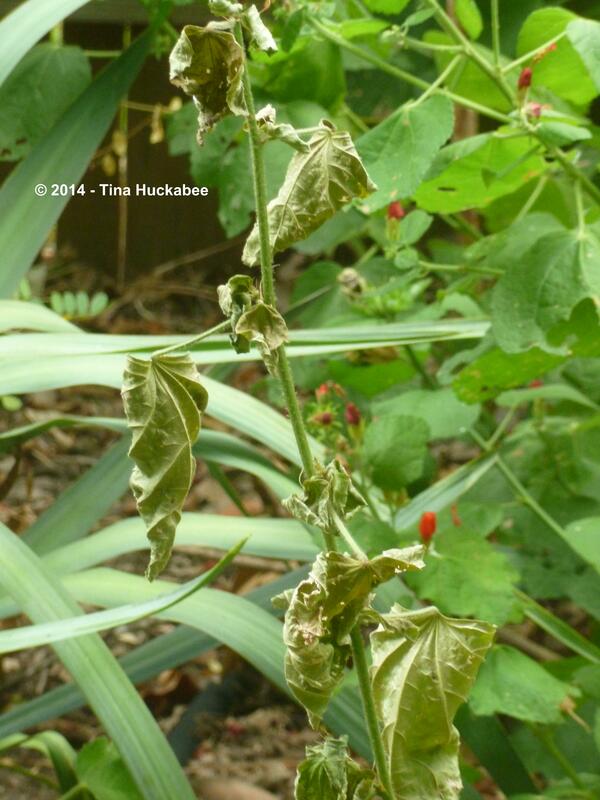 I don’t know why the plant is dying–it may simply be that Rosemallow is not long-lived here in Central Texas. Rosemallow is not native, though it’s considered an appropriate landscape perennial for many places, including Central Texas. It was one of the best bloomers during the hellish 2011 summer of record heat and drought and it returned vigorously after our hard winter this past year. In between, I’ve been impressed with this lovely, but tough perennial because of its graceful form and constant blooming, coupled with its ability to shrug off drought conditions. ….and have only three left stems left. 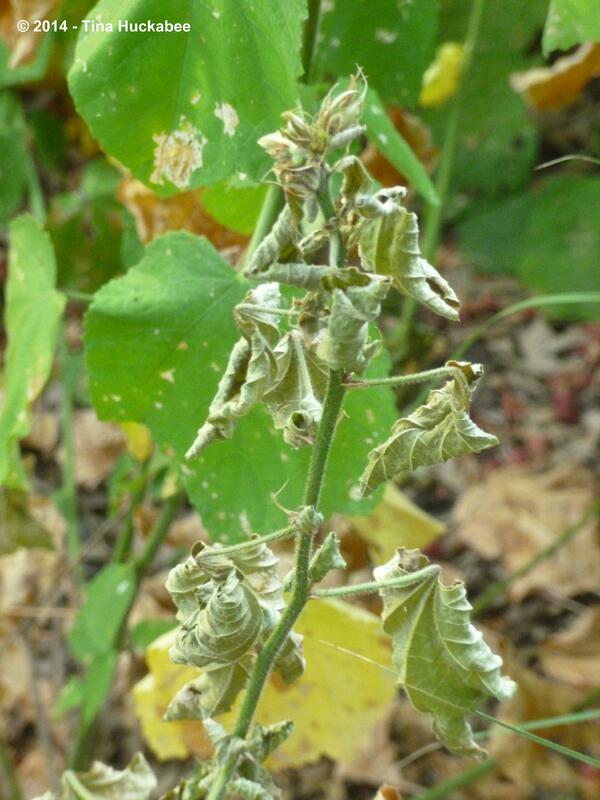 Those stems will be gone soon–I can see the necrosis of the leaves beginning. I’m sorry that this plant is at the end of its days, but I’m philosophical about my gardens and the plants I grow, even when an adored plant dies: it’s not the end of the world, there are way bigger problems than silly garden issues and the death of one plant is an opportunity to try something new. Or not. But I think in this case, as much as I’ve enjoyed the Rosemallow in that spot, I’m going with something different. A gardening friend is gifting to me some Garlic Chives, Allium tuberosum. I know that Garlic Chives are aggressive in the garden, but bees relish the blossoms and that mitigates any negative issues I might have with the plants. I’ll be a good gardener parent and practice tough love; I’ll make sure that the Chives don’t get out of hand and annex more than their assigned garden spaces. Remember that statement when I’m complaining in four years that the Garlic Chives are everywhere. …and it’s doing well. It’s grown, bloomed several times, and is filling out beautifully. I’ll let the idea of planting another Rosemallow somewhere else rumble around in my head for a while and maybe figure out another spot for some future planting date. For now though, I’ll say a fond goodbye to a beloved perennial and its beautiful flowers. 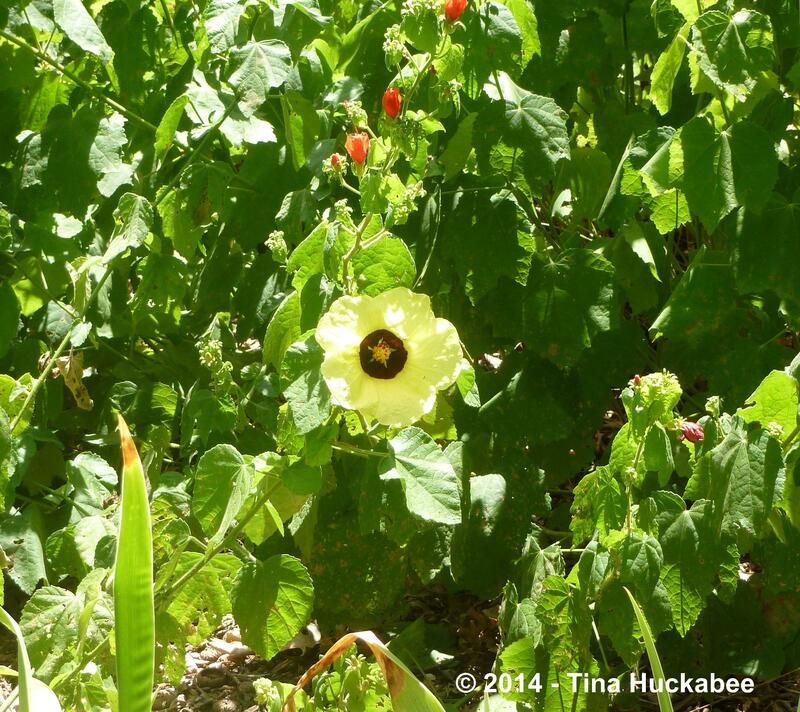 This entry was posted in Hibiscus calyphyllus, Lemon Rosemallow, Uncategorized and tagged Hibiscus calyphyllus, Lemon Rosemallow by Tina. Bookmark the permalink. Farewell rosemallow – you certainly filled your spot in the garden and in the gardener’s heart with beauty and grace. I’m happy to see your new rosemallow looking so perky. Those flowers are stunning, no question about it. I hear you about 4 years from now when you’ll be complaining the garlic chives are everywhere. I’m letting a couple of patches of bristly mallow establish as a groundcover – they are considered weeds by nearly everyone else but I adore their tiny orange flowers in the spring and scalloped leaves now. My theory is they’ll smother out bird food seed sprouts under the feeder. I’m really hoping with all my gardener’s heart that these little mallows will stay where I want them and not jump out everywhere. I’m guessing if I keep the seed heads trimmed off that will do the trick but time will tell. I’ll check back in with you about that in 4 years, OK? Hand shake, deal! I know that bristly mallow–I learned about it from you! I have one or two in my gardens and I agree about that tiny little flower–so, so pretty. So, let’s coordinate our complaints in the future about our wayward flowers! It’s disappointing when this happens in the garden and I like your approach to planting a new one and making a few changes. The colors are a pretty addition to the summer garden. My garlic chives were also gifted from a fellow gardener and they are doing well after two years but haven’t taken over yet. When they do outgrow their space we can gift some to another gardener. 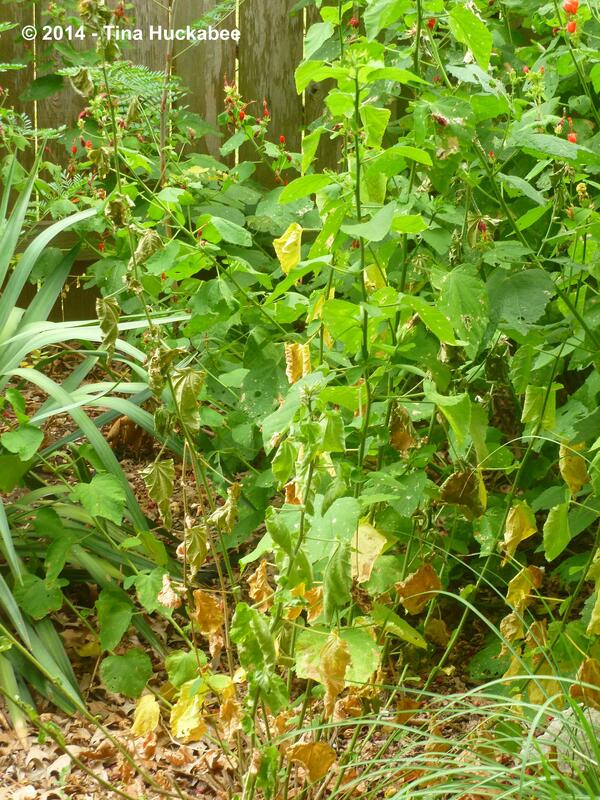 It is disappointing, especially as the Rosemallow came back like gangbusters after our hard, late freezes, but, oh well! I’m glad to hear that the garlic chives haven’t been too aggressive for you–I’m looking forward to them! It’s so much fun to trade with other gardeners. Like you, I’ll be happy to do so with the chives, or anything else that wants to spread its “wings”! Blah. That is disappointing when that happens. Like Shirley I admire your openess to change. 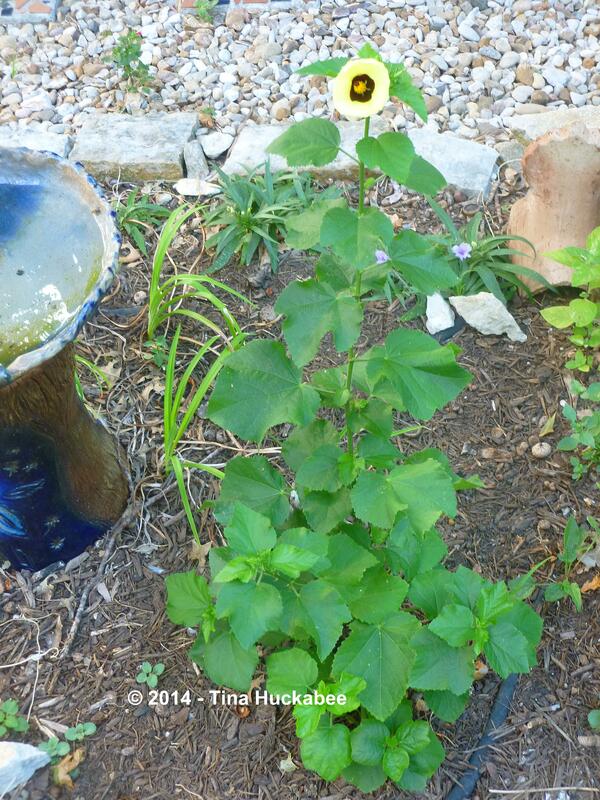 It’s a bummer, but life and gardening goes on…. Too bad it’s on its last days, but it sounds like you have a good attitude about it. I wonder if it’s simply dying back for the season–perhaps it will reappear next spring? Sometimes that happens here. Does that every happen in Texas? Rosemallow is such a pretty plant. No matter what you do and what plants you choose, I’m sure it will turn out great! 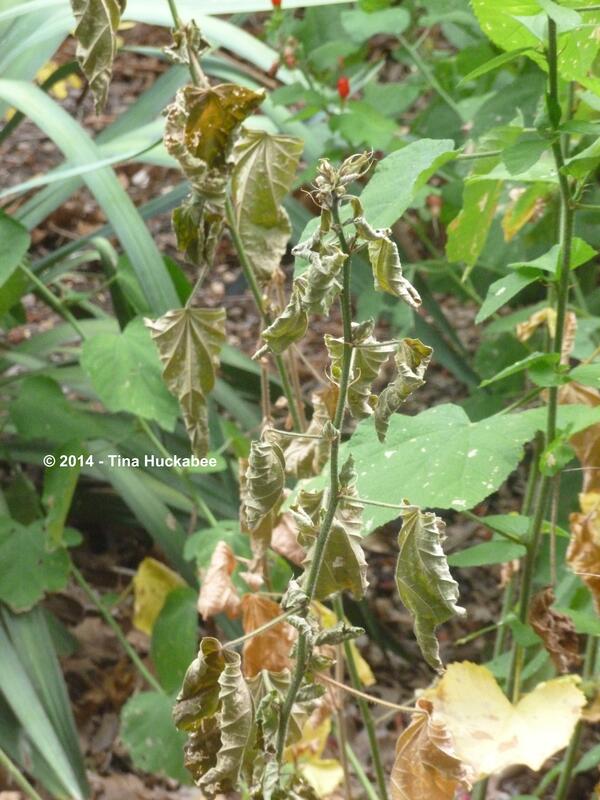 There are plants in Texas that are seasonal and the wilt and fade until their time to shine again. I don’t think that’s true here, unfortunately. The mallow hasn’t ever done this dying by the stems thing before, so yeah. Bummer. I suppose there’s still a possibility that it could flush out with new and healthy growth, but I’m not expecting it to. Life in the garden–moving on! 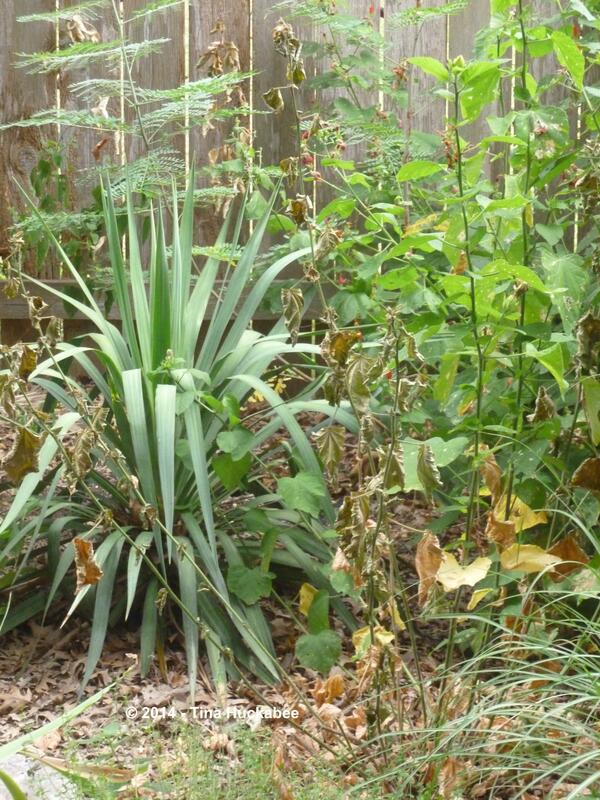 As gardeners we have to look on the death of a plant as an opportunity to try something new. The trouble is we mourn the passing of each one. 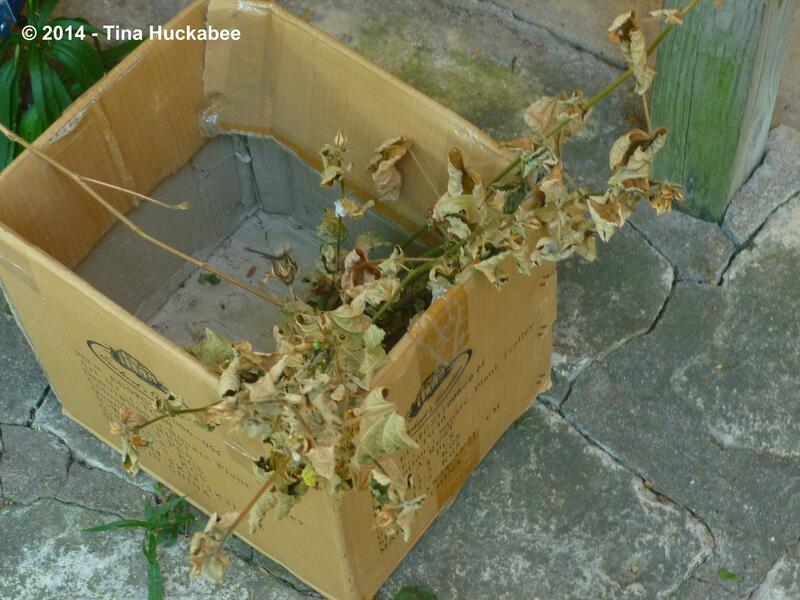 It is difficult to care for plants without getting attached to them. I always thought this pretty plant is an annual. It is in my garden. You’re right, Chloris and there are always new plants to try. It’s a bit sad when you’ve enjoyed something in the garden, but exciting to re-think an area. I’m not surprised that rosemallow would be an annual for you–your climate is chilly. I think, at best, it’s probably a short-lived perennial for us. After all, it hails from Africa and Madagascar–generally warm climates.